More focused metallic sound, less swishy than typical sleigh bells. For Impressions d’Italie: Symphonic Suite for Orchestra, An Alice Symphony and other pieces. 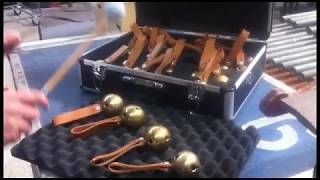 Emil Richards had a two-octave set of chromatic sleigh bells which he acquired in the 1970s. He occasionally would call the J.C. Deagan instrument company to ask if they had any eclectic instruments which he didn’t have, and found out about the set of chromatic sleigh bells. They were useful in the studio, as the western tuning allowed them to mesh with the tuning of the traditional orchestra. However, Emil also used them in live performances, as he and other musicians would take the sleigh bells around the neighborhood and play Christmas carols together with them. Quick tuned sleigh bells demo. Can be hit with mallets for unique sound.